Even at 9 years old, Dr. McRae knew he wanted to be a doctor. “The chiropractor who helped me get rid of my migraines said, “Why don’t you look into chiropractic? I think you’d be good at it.” Dr. McRae did look into this form of natural health care and liked that it focused on prevention and keeping people well instead of waiting until things fall apart. After earning his undergraduate degree from Central Michigan University, Dr. McRae went to Logan College of Chiropractic (now Logan University) to earn his Doctor of Chiropractic. He graduated in 1997 and has enjoyed practicing for more than 20 years. Before coming to Pray Chiropractic, he worked extensively in functional medicine and owned several chiropractic clinics. 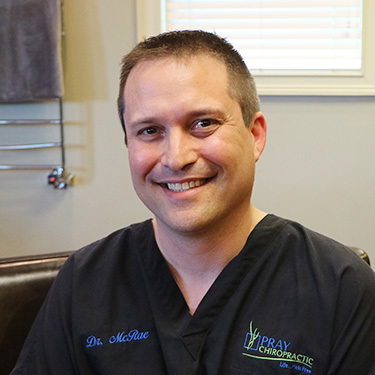 Not only is it gratifying to help his patients get out of pain, but Dr. McRae enjoys helping them return to participating in their favorite activities. He sees patients of all ages in the Ringgold office and appreciates being able to help people in his community. Dr. McRae and his wife Jennifer have three sons: John, Caleb and Luke. In addition to spending time with his family, he also likes to hunt, fish and travel from time to time. Contact our chiropractic office today to book an appointment with Dr. McRae! Our office is open late and on Saturday morning.